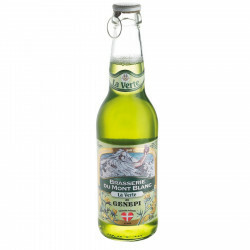 A green-coloured beer with genepi flavourings. La Verte du Mont Blanc (The Green of the Mount Blanc) is a genepi-flavoured beer (a plant that grows in the mountain near moutain glaciers) brewed with the waters of the Mount Blanc glaciers. A quite attractive, light and original beer. Recommended tasting temperature: 3°. Chilly! 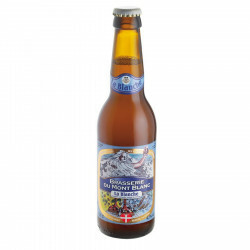 In the end of the 19th century, eight breweries were nestled at the heart of the Alpine mountains, attracted both by the quality of the waters and the glaciers, perfect for production and conservation. In 1821, we may find evidence of the first established brewery in Sallanches, Haute-Savoie, employing only one worker and selling 6500 liters a year. In 1911, the Challamel, Boucharge & Viard Company takes the name of the “Beer of the Mont-Blanc”. In the summer, the Brasserie du Mont-Blanc (Brewery of the Mount-Blanc) produces more than 4 000 hectoliters of fermented drink against only 150 hectoliters in autumn. The cellars are made of glass-lined steel and maintained at 0 degree with the ice fetched in the Arve Pond. When winters are not cold enough, the brewers fetch the ice from the Bionnassay or Bossons Glaciers. About 40 brewers work there, but unfortunately, the brewery stops all operations in 1966. But a determined and passionate young Savoyard (from Savoie), Sylvain Chiron, revived the beer of the Mount-Blanc in 1999. During his studies, he travelled to the United States and was surprised how successful micro-breweries are. Back in France, he focused on fermented drinks and in 1996, purchased the distillery of the Aiguebelle Cistercian abbey with two associates, located in Provencal Drome. During three years, he strived to revive the Aiguebelle syrups and liqueurs. As he was looking for pure waters to produce quality beer, he rediscovered, in his home region, an old forgotten brand: “The Beer of the Mount-Blanc”. This is how he formulated the desire to recreate a Trappist beer. The Abbey father opened the doors to the Trappist monastery where Sylvain learnt the art of brewing and the manufacturing secrets that are making the success of his products today. Together with one of the best Belgian brewers and his friend, Master Distiller of Aiguebelle, Sylvain starts devising the first recipes of the Mount-Blanc beer. During a trek to the Houches, he discovers the spring of Enchapleuze, 2074 meters high, right under the Aiguille du Goûter (The Peak of the Goûter). On his way back, and after a thorough analysis, he chooses to produce his beers with these spring waters. In 1999, the Mount-Blanc brewery moves to La Motte-Servolex at the heart of Savoie and starts producing the beer of the “Mont-Blanc”. These authentic, full of character quality beers are brewed with spring water flowing from the Mont-Blanc glaciers. A light white and refreshing beer.